By 2030, according to UN data, one-fifth of us will be over the age of 60. As the labour pool shrinks, the stress of overtime work is affecting many employees, both in the developed and developing world, leading to a deterioration of worker health and well-being. How can companies ensure they have a workplace culture that values employee welfare while still meeting productivity goals? Generally, since the inception of the 40-hour week – introduced by Henry Ford during America’s Industrial Revolution – governments have tried to shorten official working hours. However, following years of optimism about reduced working hours and some progress in legal measures limiting them, the reality of the situation has changed little. In Singapore, for example, a study found staff to be overworked and underpaid. Over in Australia, another study found that teachers are struggling to cope with heavier workloads, with more than three-quarters saying time spent on school-related activities has increased in the past year. In Japan, a recent government whitepaper on “Karoshi” – a term that means “death by overwork” – said that nearly one in four companies have employees who do more than 80 hours of unpaid work per month. Measured by industry, IT workers were found to be the most overworked, followed by those in academic, research and engineering-sector organizations. The research reveals that 80 hours is the threshold at which the incidence of fatal health conditions seemingly increases dramatically. These reports highlight an urgent need for a transformation in the workplace to improve employee well-being and health. While corporate Japan is taking notice of the issue and changes are afoot, adoption has been slow. In many countries, provisions that require overtime work to be voluntary appear to be breached. The degree of observance varies, depending on the size of firms and the presence of unions. While productivity is firmly at the top of most companies’ agendas, preserving workers’ health and workplace safety should be at the heart of this. Based on JLL’s 2015 Corporate Real Estate (CRE) survey, the drive towards productivity improvement has led global CRE teams to focus more intensely on workplace strategy in recent years. Sixty-two percent of respondents have seen increasing demand from leadership for more flexible forms of working, while 59% have been asked to support wider cultural change within their organizations. More than three-in-five respondents reported a growing appetite for flexibility through the real estate portfolio – for example through larger volumes of on-demand space. According to the report, demand for these types of changes has been lower in Japan than other countries. Responses from over 30 Japan-based CRE executives showed that only 31% of companies reported increasing C-suite demand for flexible working, versus 62% globally. Further, just 38% of those surveyed believed in enhancing the workplace experience – for example, through health and well-being programmes – compared to 71% globally. Overworked employees report more health problems, and as a direct consequence are less productive and use more sick days. A solution is to make the office more than merely a place of work. Mental downtime can increase productivity and replenish energy during demanding workdays. While some companies favour breakout areas – designed for employees to think and work differently, such as tech company Epic’s treehouse conference room or Box’s indoor swings – break rooms should let staff get away from all things job-related. However, these practices don’t work for every corporate culture. For instance, games rooms complete with billiards and pinball machines may work for employees working in offices that thrive on collaboration, energy and creativity, but such arrangements may not work for a law firm. Similarly, while 80% of all work is collaborative, that doesn’t mean “heads down” work has decreased. In Japan, several health campaigns are currently in operation. For example, a leading Japanese e-commerce company recently began providing desks that allow employees to sit or stand as they work. A Tokyo-based electrical equipment manufacturing company has been promoting healthcare initiatives to its employees by providing them with pedometers and exercise bars in the workplace. Such measures improve mood and cognitive function by breaking up the monotony of the work day with physical movement, and also decrease the incidence of metabolic health concerns. But these initiatives are the exception rather than the rule across Japan. 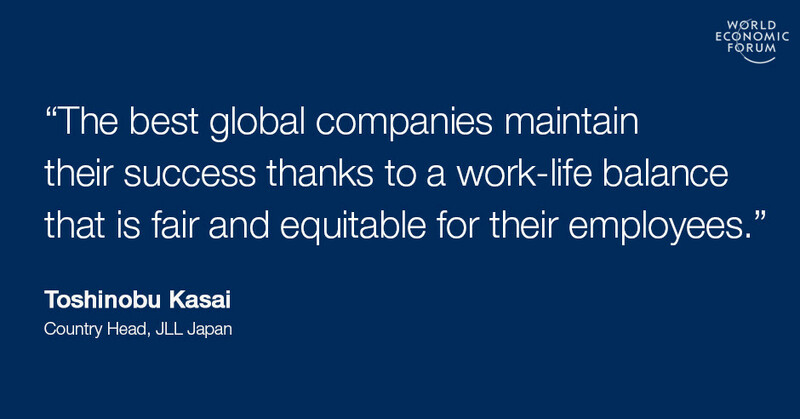 The best global companies maintain their success thanks to a work-life balance that is fair and equitable for their employees. In the US, for instance, gyms are the most requested amenity among workers at JLL-managed properties. In Australia, concierge services that help bring lunch and pick up dry-cleaning are gaining popularity. Legislation and rhetoric aside, companies need to embrace change and scale up workplace transformation. By promoting well-being in the workplace, companies stand to dramatically improve the working conditions of their labour forces. A happy employee is a loyal and productive employee, and the corporate world should aim for a workplace that maximizes employee happiness, which will ultimately lead to better business performance.